Idun and the Apples (1890) by J. Doyle Penrose. Iðunn (romanized "Idun") is one of the goddesses of the Norse pantheon. She is best known in two unrelated roles: as the wife of Bragi (the god of poetry) and as keeper of the golden apples of immortality (which maintain the youth and vitality of the Aesir). Despite the lack of any evidence of extensive cultic worship, Idun was nonetheless a notable and relevant member of the Norse pantheon. More specifically, the tale of her kidnapping by the giant Þjazi and her subsequent rescue by Loki provides one of the more exhilarating moments in Norse mythology—one which is recorded in the famous texts of the Poetic and Prose Eddas. The goddess is also the subject of numerous depictions in later artwork. As a Norse deity, Idun belonged to a complex religious, mythological and cosmological belief system shared by the Scandinavian and Germanic peoples. This mythological tradition, of which the Scandinavian (and particularly Icelandic) sub-groups are best preserved, developed in the period from the first manifestations of religious and material culture in approximately 1000 B.C.E. until the Christianization of the area, a process that occurred primarily from 900-1200 C.E. The tales recorded within this mythological corpus tend to exemplify a unified cultural focus on physical prowess and military might. Among the deities of the Norse pantheon, Idun is best known as the caretaker of the apples of immortality, which maintained the youthful appearances of the Aesir and Vanir. Also, she is also described as the wife of Bragi, the god of poetry. Idun's primary role within the Norse mythic corpus was as the custodian of the fruit of immortality: as "she guards in her chest of ash those apples which the gods must taste whensoever they grow old; and then they all become young, and so it shall be even unto the Weird [Urd - "Ultimate Fate"] of the Gods [Ragnarök]." This [her abduction] is one of the most dangerous moments for the gods in the mythological present, for giants are not supposed to be able to mate with goddesses. The fact that the gods grow old and gray—that is, display mortality—indicates what would happen if the flow of females, ordinarily from the giants to the gods, were to be reversed. 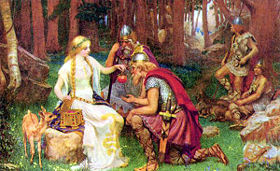 The bold contention that Idun represents the revitalization of divine society through "outside marriage" is supported by two notable facts—one textual, the other etymological: first, in one account of this tale (found in the Haustlöng), Idun herself is described as the "maiden who understood the eternal life of the aesir" without any mention of apples (or other symbolic objects); second, the "etymological meaning of Idun—'ever young'—would permit her to carry out her mythic function without apples." From a sociological perspective, this interpretation is notable, as it provides an etiological rationale (and superhuman justification) for the Viking tendency towards exogamous marriage. For I wish not that fierce they should fight." In this selection, Idun is portrayed as a dutiful wife, ignoring the trickster god's impugning comments in favor of trying to keep her husband from an altercation that he would likely lose. These two attributes comprise virtually all mythic depictions of the goddess, especially if one includes the tale of her abduction (described below). This somewhat "one-dimensional" characterization is exemplified in Snorri Sturluson's guide for aspiring bards (the Skáldskaparmál), where he asks the rhetorical question: "How should Idunn be periphrased? Thus: by calling her Wife of Bragi, and Keeper of the Apples; and the apples should be called Age-Elixir of the Aesir. Idunn is also called Spoil of the Giant Thjazi, according to the tale that has been told before, how he took her away from the Aesir." The single, surviving mythic tale concerning Idun (as intimated above) is the account of her abduction by the giant Þjazi. For her ravisher's actions to make sense, however, it is necessary to begin by providing the context for his attack. Following this background information, the episode itself will be recounted in detail according to the surviving version of the tale in Snorri's Prose Edda. The tale begins with three Aesir—Odin, Loki and Hoenir—trekking through the wilderness in search of a meal. After hours of foraging, the three gods finally found and slew an ox, which they proceeded to carve, place on a spit and begin roasting. It was not long before the Aesir noted that the meat had not even begun to brown. Perplexed, they demolished their old fire pit and rebuilt it, but to no avail—the meat still refused to cook. Suddenly, they heard a voice speaking to them from a nearby bough, where an enormous eagle sat, eying them ferociously. It took taking credit for their inability to prepare the meat, but made a suggestion: "If ye are willing to give me my fill of the ox, then it will cook in the fire." Lacking other options, the three Aesir agreed. No sooner had the meat begun to cook than the eagle swooped down and snatched the bulk of the animal for himself. Enraged, Loki leapt at him, aiming to pummel the thieving bird. Unfortunately, his cudgel magically fastened itself to the creature's back, who proceeded to launch itself skyward, trickster god in tow. Dangling by his arms over the abyss of space, Loki shrieked and begged to be released. The eagle, who identified himself as Þjazi in bird form, stated that his prisoner "should never be loosed, unless he would give him his oath to induce Idunn to come out of Asgard with her apples." The pained god, arms aching, took the vow and was released. Though Loki knew the ill consequences that this promise would cause, he could still not break his oath. So, he beguiled Idun to leave Asgard with him and delivered her into the clutches of the giant, who, still in eagle form, snatched her in his claws and returned to his keep. Meanwhile, the loss of the goddess (and, more specifically, her magical apples) was being sorely felt by the Aesir, who were quickly becoming "hoary and old... gruesome of fashion and ugly." When they realized that Loki was the last one to be seen with the kidnapped goddess, he was compelled to set out in search of her and told, under pain of torturous death, not to return to Asgard without her. To aid in his mission, Freyja lent the god her falcon-feathered robe, which allowed him to take the form of a bird. Flying to Þrymheimr, the giant's castle, Loki was fortunate enough to arrive when the keep's lord was out fishing. He quickly transformed Idun into a nut, picked her up in his talons, and flew with all his might towards the safety of Asgard. Þjazi, seeing his prize vanishing over the horizon, quickly metamorphosed into an eagle and gave chase. Meanwhile, the Aesir, anxious for the return of Idun, prepared a firetrap for the giant. As soon as the hawk flew into the citadel, he [the giant] swooped down close by the caste-wall; then the Aesir struck fire to the plane-shavings. But the eagle could not stop himself when he missed the hawk: the feathers of the eagle caught fire, and straightaway his flight ceased. Then the Aesir were near at hand and slew Thjazi the giant within the Gate of the Aesir, and that slaying is exceedingly famous. Though Idun is not a highly prominent figure in Norse mythology, she was chosen as subject matter for a variety of Western art. Bragi is shown with a harp and accompanied by his wife Iðunn in this nineteenth-century painting by Nils Blommér. Loki lures Iðunn away, by John Bauer. ↑ Though some scholars argue that this reference to "apples" implies that she is a later interpolation, it should be noted that the noun translated as apple is, in fact, a general term "applied to other round fruits, and even to acorns." Turville-Petre, 186. ↑ Snorri Sturluson, Gylfaginning XXVI, Brodeur 39. ↑ 6.0 6.1 Lindow, 199. ↑ J. T. Williams, "Origin and Population-Structure of the Icelanders," Human Biology 65 (2): April 1993. 167-191. Williams notes that "the western, northern, and southern regions of Iceland exhibit a moderate Celtic component, consistent with historical indications that these regions were settled by Norse Vikings from the British Isles, accompanied by Celtic wives and slaves" (167). This is one example of the type of exogamous marriage that was common among the sea-faring Norsemen. ↑ This seems to be an allusion to a mythic episode that is not among the received Norse materials. ↑ "Lokasenna" in The Poetic Edda. Translated and with notes by Henry Adams Bellows. Princeton: Princeton University Press, 1936. Accessed online at sacred-texts.com. 157-158. Bellows notes (ff. 152) that Idun [here romanized as Ithun] is a singularly unpopular figure within the Poetic Edda, and that she is only mentioned by name in the Lokasenna section quoted above. ↑ Snorri Sturluson, Skáldskaparmál XXII, Brodeur 129-130. ↑ 11.0 11.1 Snorri Sturluson, Skáldskaparmál I, Brodeur 90. ↑ Haustlöng, quoted in Snorri Sturluson, Skáldskaparmál XXII, Brodeur 132-133. ↑ Snorri Sturluson, Skáldskaparmál I, Brodeur 91. Grammaticus, Saxo. The Danish History (Volumes I-IX). Translated by Oliver Elton. Norroena Society, New York, 1905. Accessed online at The Online Medieval & Classical Library Retrieved April 17, 2008. Sturluson, Snorri. The Prose Edda. Translated from the Icelandic and with an introduction by Arthur Gilchrist Brodeur. New York: American-Scandinavian foundation, 1916. Available online at The Northvegr Foundation Retrieved April 17, 2008. "Lokasenna" in The Poetic Edda. Translated and with notes by Henry Adams Bellows. Princeton: Princeton University Press, 1936. Accessed online at sacred-texts.com Retrieved April 17, 2008. Norse Mythology: Idun from Hurstwic, a Viking Age Living History Society. This page was last modified on 24 February 2018, at 22:37.